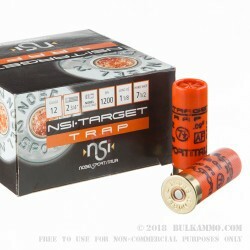 NobelSport Italia is thoroughly dedicated to their ammunition’s quality, so much so that they insist on only using components which they themselves have manufactured from raw materials. 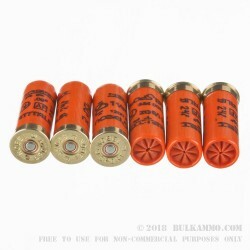 They continually conduct ballistic research, chemically and physically analyze their prototypes, and field test all of their products to a fare-thee-well as part of their commitment to offering only the highest performing ammunition known to earth. 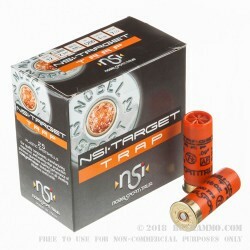 This 12 Gauge shotshell from NobelSport’s NSI•Target Trap line of ammunition is loaded with 1 ⅛ ounces of #7.5 lead shot. 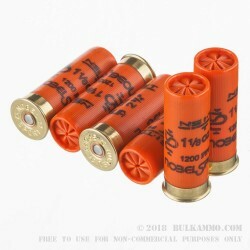 These .095” pellets’ size, spacing, and range work together to make them one of the most popular clay busting shots on the market, a distinction to which it owes its great ubiquity. You wouldn’t be out of luck if you used this shell to hunt for upland game, either, but it’s on the range where its sturdy plastic hull, consistently patterning wad, and sensitive primer will really shine best.